Maximize your meeting space with this convenient wall-mounting bracket designed for projection screens. Durable wall bracket extends manual and electric hanging screens 6" from the wall and in front of existing presentation tools, such as writing boards or blackboards for more efficient use of space. Bracket enables your screen to be hung to avoid artwork, chalkboards, whiteboards and other wall hangings. 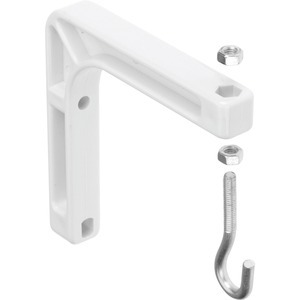 Mount with just two screws for easy installation. Bracket can also be used as a ceiling bracket.